For my friends' recent baby party I also made a trio of tartlets, inspired by Chockylit and just right for a spring afternoon. Besides, I had just given in to the lure of some pretty new toys, on sale at Crate & Barrel. I've heard a lot about the newish silicone pans, and I've looked at them thoughtfully upon several occasions, but I was skeptical about this newfangled stuff, and rather put off by the prices. Then, a couple weeks ago I was scrubbing in vain at my supposedly nonstick muffins pans and growing hotter, crankier, and more exasperated by the minute. Finally I flung the older of the two, scarred and stained, into the trash for good. I remain unrepentant about the contribution to my local landfill - tins are such a pain to clean up, twisting the scrubbie around and around in the elusive round corners of the little cups. I decided to go silicone. 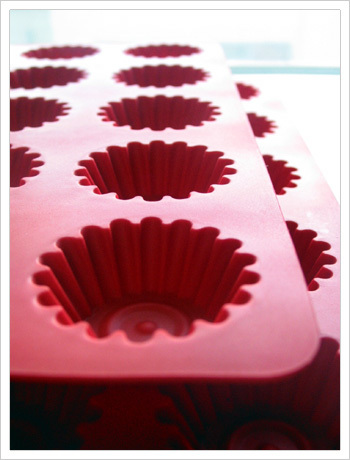 So then, these beauties were on sale, and while twee tart pans hardly replace my more staid and practical muffin tins, I justified them as tools for party baking. Hopefully they would lower my workload a little, just a little, I mused. Maybe they would be just a bit easier to clean up. As I am skeptical by nature, I still expected my little pastry shells to have some problems coming out of the cups - space age material or no. Surely they would stick a little; nothing is as good as it seems, right? Oh me oh my. What have I been missing all this time? The shells came out beautifully. More precisely, they slipped right out, leaving nothing but a light sheen of oil behind, any lumpiness due to my own heavy hand with pastry dough. And I didn't even grease them! I am now a convert, let me tell you. I'm never going back to my old muffin tins. I just pray no one morbidly declares them cancer-causing or any such thing - I wouldn't pay much attention, I'm afraid. I filled the miraculous pastry shells with three different kinds of citrus curd, all from one basic recipe. I did add a vanilla bean to the grapefruit, which masked the grapefruit taste a little too much, to my disappointment. I was told, however, that they tasted like Dreamsicles, so they can't have been all bad - just not what I had been imagining. 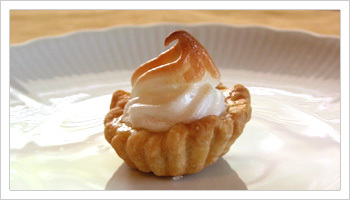 I topped them all with a sugar syrup meringue, toasted in the oven. 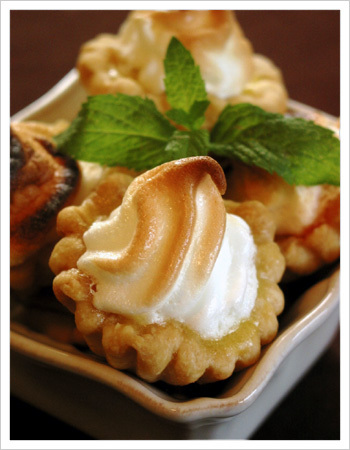 I put cardamom in the meringue for the lime tartlets, and this combination - light and sweet, green and puckeringly tart, starting off with a pinch of exotic spice and finished with a dash of crunchy salt from the shell - this was my very favorite. 1. Blend flour and salt in processor. 2. Add butter; using on/off turns, cut in until mixture resembles coarse meal. 3. Add 3 tablespoons ice water and cream. Process just until moist clumps form, adding more ice water by teaspoonfuls if dough is dry. 1. Have a strainer, suspended over a bowl, ready near the range. 2. In a heavy noncorrodible saucepan, beat the egg yolks and sugar with a wooden spoon until well blended - light yellow ribbons. 3. Stir in the lemon juice, butter, and salt. 5. Remove from the heat, cool, and store in the refrigerator for up to a week. 1. Let egg whites warm to room temperature, then put in the bowl of a stand mixer. The bowl and beaters must be scrupulously clean of grease. 2. Add salt and beat egg whites until foamy. 3. Add cream of tartar. 4. Beat until the whites hold soft peaks. 5. Meanwhile, heat sugar and water in a small saucepan just until boiling, then take off the heat. 6. Pour the sugar syrup into a heatproof container like a measuring glass. 7. With the beaters running, stream the sugar syrup very, very slowly into the whites. 8. Beat until they hold stiff peaks. After this it is ready to be either spooned or piped onto the tarts. Note: I have had some trouble with meringues, and I have to say that this one is the most stable that I've ever tried. The cream of tartar helps, and the sugar syrup also slightly cooks the whites and stabilizes them, keeping them from "weeping" later. I found this technique mentioned over at bakingsheet, and it was really helpful with these since they needed to sit out at room temperature for several hours during the party. Lovely lovely lovely! I will try those!!!! I've been on the lookout for a cardamom-scnted dessert, seen so many that sounded almost like something I'd like to try. But this really seems to hit it spot on. And the silicone - I love mine, too, but I bet it's especially great for tarlet pans. Thanks Bea and littlebouffe! You know, I first got the idea of a lime/cardamom pairing from this fabulous one-of-a-kind ice cream place in Columbus, OH, called Jeni's Ice Cream. They have a lime cardamom sherbet, and it's amazing. I was like, why didn't I ever think of this? It's one of my favorite combinations now. Very beautiful looking tarts. I can almost taste the bite from here. i too found silicone to be an amazing surprise. i'm really happy that i can stay in touch with you & your cooking skills. man, these make me wish i had even a little talent in the baking world, they are GOREGOUS!